My frosh football coach in high school, back in 1990, had a GREAT warm up chant that I’ve used for the 12 years I’ve coached. After we all game together right after stretching, and then right before kickoff, he would yell out “Fellas, how do you play this game?” We would all yell back at the top of our lungs, “With ENNNTTHHUUUUUUUUUUUUUUUUUUUUUUUSSIASSMMM!” There was a big, long, drawn out emphasis on the long U. 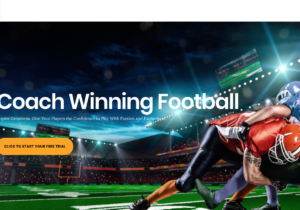 You can’t play football without enthusiasm, and you certainly can’t be an effective leader without it. Are you excited about your leadership position?? Do others around you know how much you love your job? Do they know not only that you love your job, but that you are excited about your position? 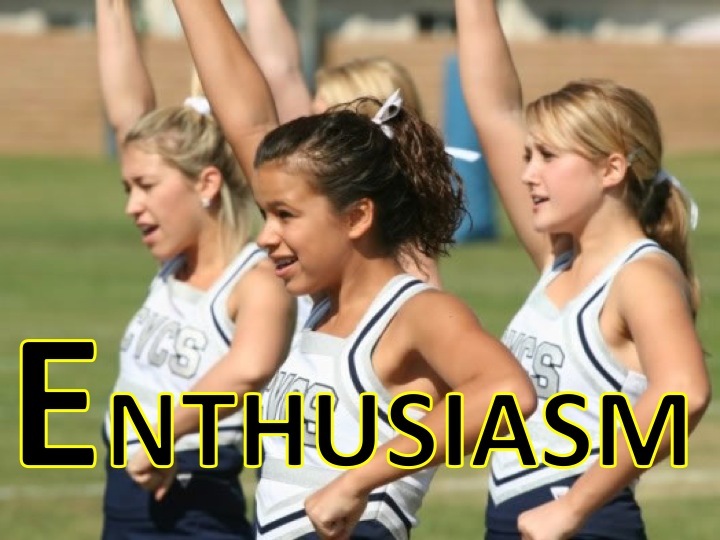 Enthusiasm is one of those things that I’ve seen build campuses up and tear campuses down. If the leader is enthusiastic, it can catch like wildfire. If the head coach is enthusiastic no matter the situation, his assistants will be enthusiastic, and that will flow over to the players. All of a sudden, enthusiasm is spreading. I have to admit, I’m not the most enthusiastic person. My personality is more pessimistic, than optimistic, so I really need to work on being enthusiastic. Those who are more pessimistic have a harder time being enthusiastic. The reverse is true too. If the leader isn’t enthusiastic about this leadership position, and the task at hand, his followers won’t be enthusiastic. I worked for a company where we went through a change at the top man. There was a night and day difference between his leadership style and the former boss. The former boss was enthusiastic every time you walked in to our administrative meeting. Always a smile on his face, every day was a new opportunity. He was fun to work for. Our meetings were fun to be in. The whole team seemed to work very well together. When the change happened, it changed the dynamic of the whole room, and the team. The positive vibe wasn’t in that room anymore. It was all business, all of the time and usually with a negative tone. It was interesting to see what enthusiasm, or lack of it, did to the team. Lou Holtz is one of the most enthusiastic people I’ve ever seen speak in person. He is the same way as a commentator, and he certainly was an enthusiastic coach! 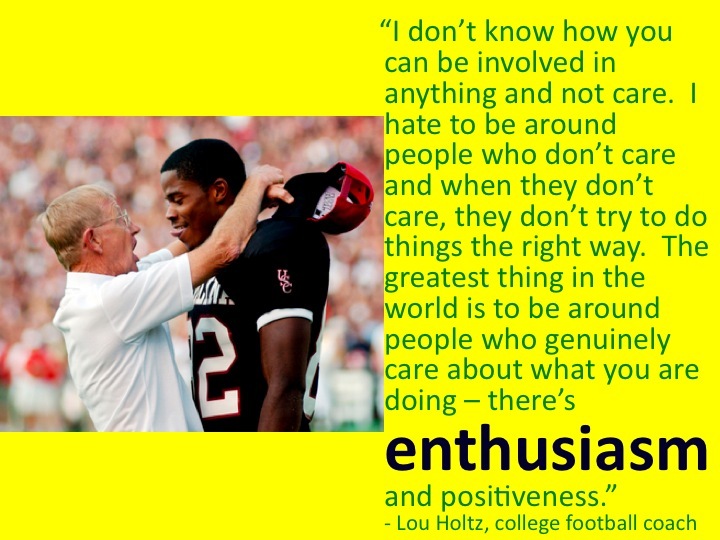 I really love this quote about enthusiasm!